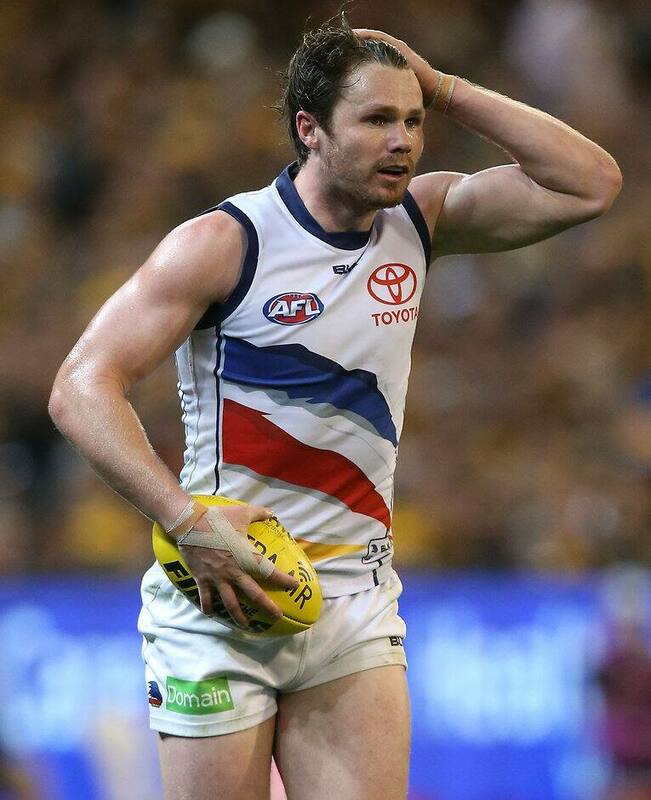 ADELAIDE CEO Andrew Fagan has all but confirmed the Crows will match any offer made for restricted free agent Patrick Dangerfield, ensuring the club gets the best possible deal. Should Dangerfield join Geelong as a free agent, the Crows would only receive the pick immediately after their first (No.13) at the NAB AFL Draft as compensation. If they match the Cats' offer though, then Geelong would be forced to trade for Dangerfield and would have to offer a tastier proposition. Fagan said it was "inappropriate" to reveal exactly what the club wanted in a trade for Dangerfield, but he said all steps would be taken to secure it. Fagan said Dangerfield's decision to leave the club was based solely on the lure of family – not just that of his own, but of his fiancé Mardi's as well. He said the 25-year-old swore he was content with every other aspect of playing at Adelaide. Fagan also confirmed that Dangerfield told the club two weeks before the start of the finals campaign that he intended to leave. "We did everything we could possibly do to keep him and then in Paddy's own words, 'if it was just on the football club, the health of the football program, on the chances of future success here at Adelaide, on his enjoyment of the city of Adelaide and the people that he spends time with through every day and every week', then he'd have no reason to leave," he said. "But for a compulsion to go home and be back in Geelong with his family and Mardi's family." After being told of Dangerfield's intention to exercise his free agency rights, Fagan then discussed with him the best way to approach his departure and pointed to Kurt Tippett's fabled exit as the perfect example of how not to handle it. Tippett infamously cited homesickness as his motivation to leave West Lakes in 2012, before joining the Sydney Swans instead of Gold Coast and notifying his teammates of his decision via text message. Fagan believed it was important for Dangerfield to tell his teammates face-to-face and to also "front up" to Saturday night's best and fairest function. "The conversation I had with Paddy was that 'you need to tell the players to their faces, you need to not be that person who does it by a text message or Instagram or maybe doesn't even say goodbye'," he said. "It wasn't a debate … he wanted to be able to do that. "I think it's really important when you make these tough decisions that you know people are disappointed and that you front up and you let them know why. "Let's not have an elephant in the room at those sorts of events at the end of the year." There will also be no embarrassment felt by the club should Dangerfield take out Monday night's Brownlow Medal as a Crows player seeking a new club. If he was to claim the award, Fagan tipped the story would provide terrific front bar debate, but insisted the club would feel only pride for the outgoing superstar. "He would have won the Brownlow Medal while playing for the Adelaide Football Club and that'll be a unique part of the history of the club," he said. "It'll make for some good bar room discussion. "If he earns that right, or wins that award, the Adelaide Football Club will be pleased for him … he deserves the accolades that he's either received or that he might receive."